I was greeted by a vast array of heavy metal in the guise of chops, trikes and bikes, all lined up against the shore of the lake, making for an impressive sight who had the same idea and arriving at the venue, I was greeted by a vast array of heavy metal in the guise of chops, trikes and bikes, all lined up against the shore of the lake, making for an impressive sight. 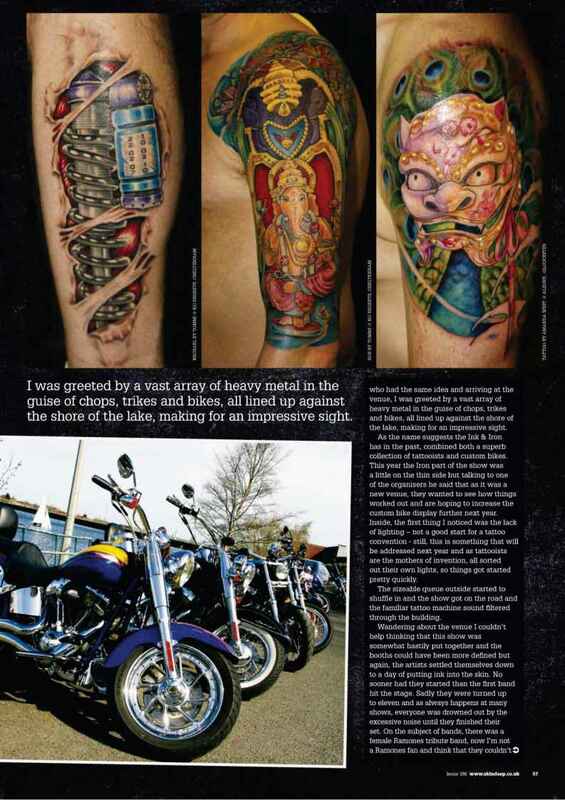 As the name suggests the Ink St Iron has in the past, combined both a superb collection of tattooists and custom bikes. This year the Iron part of the show was a little on the thin side but talking to one of the organisers he said that as it was a new venue, they wanted to see how tilings worked out and are hoping to increase the custom bike display further next year. Inside, the first thing I noticed was the lack of lighting - not a good start for a tattoo convention - still, this is something that will be addressed next year and as tattooists are the mothers of invention, all sorted out their own lights, so things got started pretty quickly. The sizeable queue outside started to shuffle in and the show got on the road and the familiar tattoo machine sound filtered through the building. carry a tune m a bucket and these ladies, although very enthusiastic, made me want to stick pencils in my ears. Just my opinion you understand, and it must be hard to get tunes to please every palate. 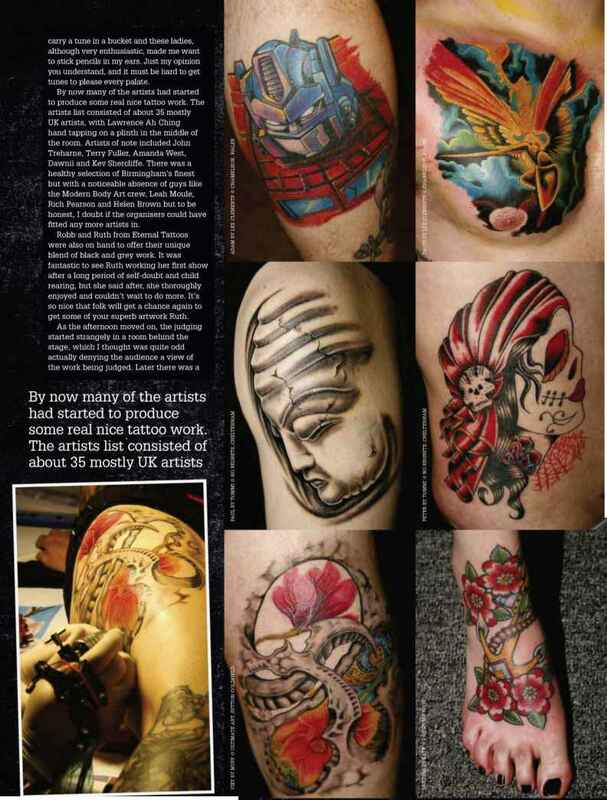 By now many of the artists had started to produce some real nice tattoo work. The artists list consisted of about 35 mostly UK artists, with Lawrence Ah Ching hand tapping on a plinth in the middle of the room. Artists of note included John Treharne, Terry Fuller, Amanda West, Dawnii and Kev Shercliffe. There was a healthy selection of Birmingham's finest but with a noticeable absence of guys like the Modem Body Art crew, Leah Moule, Rich Pearson and Helen Brown but to be honest, I doubt if the organisers could have fitted any more artists in. 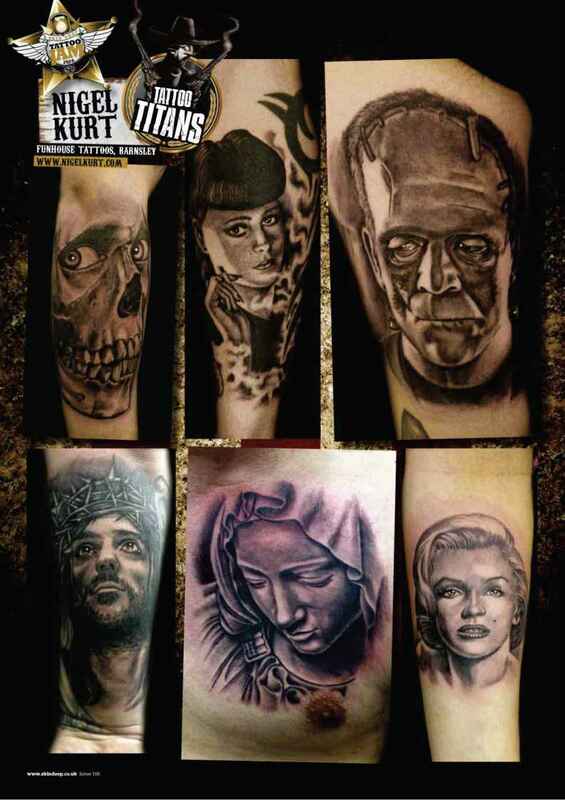 Robb and Ruth from Eternal Tattoos were also on hand to offer their unique blend of black and grey work. It was fantastic to see Ruth working her first show after a long period of self-doubt and child rearing, but she said after, she thorougliiy enjoyed and couldn't wait to do more. It's so nice that folk will get a chance again to get some of your superb artwork Ruth. The venue was quite well suited to a tattoo convention with a raised balcony running along one side, giving the public a good view of the guys I working on the ground floor. 'Tattoo Parade' on stage but this could have easily been combined with the judging as the show and tell was a little on the quiet side, with many not choosing to show off their ink to the crowd. The venue was quite well suited to a tattoo convention with a raised balcony running along one side, giving the pubhc a good view of the guys working on the ground floor. As the day wore on, we were treated to a suspension act with Alice and her cohorts suspending themselves from hooiks in a pastiche of a French restaurant set, wliich looked visually interesting; getting gasps and looked upon slack-jawed at their fakirtype feats. Not long after, the awards were handed out and as per, folk started to leave, including myself. I had a long (and very cold!) ride home, but I was kept warm by the fond memories of the new Ink & Iron show.